Who Would Use A Portable Massage Chair? Why Do You Need A Portable Massage Chair? Whether you’re working full-time as a licensed massage therapist, studying to become a qualified masseuse, or simply offering “mini-spa” treatments for friends and family, a good-quality portable massage chair is a worthwhile investment. These chairs are a fantastic advertisement for you and your services, conveying a professional image even if you’re just getting started. A good-quality massage chair will last many years, so is a sensible investment for massage students who are looking for equipment that will last them through the early years of building up a business to a point of true profitability. 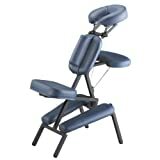 One of the main benefits of portable massage chairs is that they are ideal for therapists who work in their clients’ homes or workplaces, or those who offer their treatments at holistic wellness fairs and community events – if you are looking for a chair for this purpose, remember to check that a carry case is included in the price. Massage chairs are a better option than massage tables, as chairs offer greater adjustability options, and are easier when you need a client to change position; they are also more ergonomic from the therapists’ point of view, being easier to lean across and maneuver yourself around while working. They also typically take up less floor space, making them the most suitable option for working at events. The Oakworks Pkg3981 is a portable, adjustable, lightweight chair, with a working weight of 300lbs, making it ideal for casual events or home use. The Oakworks also comes with an instructional DVD, making it an excellent choice for students who are just getting into the practical side of massage therapy. Also from Stronglite is the Stronglite Standard Massage Chair which is made of aircraft-grade aluminum, offering stability for a working weight of up to 300lbs. 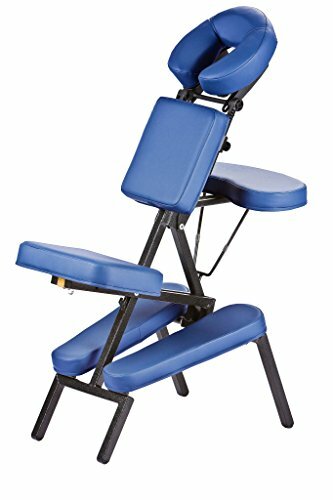 This chair comes with a carry case, offering ease of use for mobile therapists, and is fully adjustable. 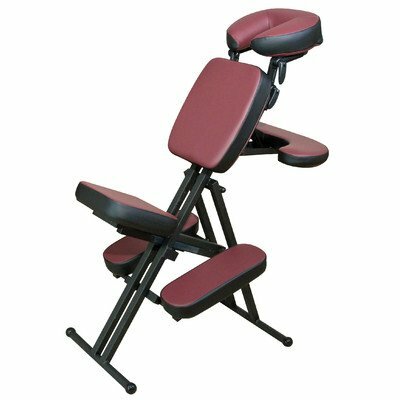 If you’re offering “mini-treatments” at events this is an ideal chair, although for full time professional therapists, it may be a little lightweight, and not quite as durable as other models. The Stronglite Ergo Pro has been designed alongside professional contemporary chair massage therapist David Palmer, founder of TouchPro, and one of the first chair massage therapists, with over 30 years of experience. The Stronglite has a working weight of up to 600lbs, meaning it’s suitable for use in clinical settings where you may be dealing with much larger clients than at events, and is fully adjustable to suit clients from 4′ 6” – 6′ 6”. It comes in a range of colors, ideal for choosing a piece of equipment that reflects both your brand and personality. It also offers a convenient, hidden storage pouch for clients’ keys, eye-glasses, etc – a simple touch that boosts the client experience, and the likelihood of positive feedback and recommendations to others. The Stronglite is easy to set up and take down, offering an ideal experience and investment for those who do most of their work at events. The Earthlite Vortex portable massage chair package is fully adjustable, offering the ability to easily tailor the chair to your working preferences, and the needs of individual clients, and comes in a range of colors, offering the perfect practical echo of your branding, and includes a carry case, making this chair ideal for event working, or therapists who have several appointments in a city area, for example, and are walking between them. The Vortex doesn’t give the visual impression of the stability needed to meet the manufacturer’s suggested working weight, so it may be best suited to hobbyists and home workers, rather than traveling therapists or event workers. COMPLETE PORTABLE MASSAGE CHAIR PACKAGE: Includes EARTHLITE Vortex Chair, Rugged Nylon Carry Case, Padded Shoulder Strap, and Sternum Pad. 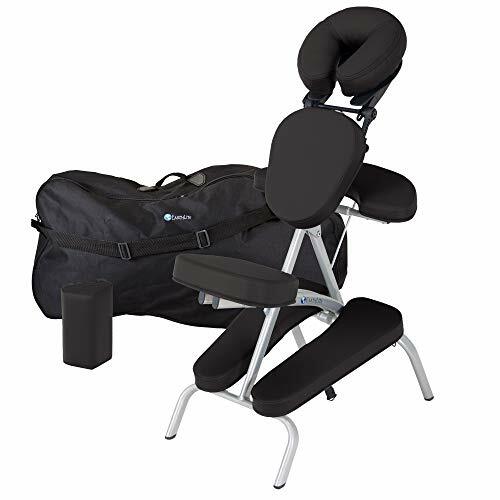 Finally, Master Massage is designed with professionals in mind, and is fully padded and adjustable, featuring a durable, ergonomic design, and convenient storage pouch. Quick and easy to set up, the Master Massage chair should be ideal for those working at events, although it is just a little heavy to carry, and so isn’t ideal for mobile therapists. If you are short you might find working on this one more uncomfortable than with some other models. In terms of client experience, a couple of drawbacks are worth noting, including that, owing to a poorly-located seam, the face rest leaves an impression on the client’s face (although you can address this with a padded or fleece cover), and the chest pad and face cradle are a little stiff and difficult to adjust. Some people have commented that the chair itself is somewhat heavy and cumbersome to move around, and therefore might be best suited to therapists who work from home, and are therefore able to leave the chair in place for the most part. Which is fine, but defeats the point if you’re looking for a truly portable one. 11" width x 20" length x 43" height; the chair itself weights 15.2lbs. Portable massage chairs are ideal for therapists who offer a range of therapies, as it is easier for a client to move, or be moved, into position on a chair than on the traditional table. The latter is also heavier, and more cumbersome, if you are doing a lot of work at events, and takes up more floor space than a chair, making it less than ideal at popular, busy functions or smaller venues. A portable massage chair may also be suitable for other practitioners such as tattooists and beauticians, thanks to its increased versatility in movement over more traditional work surfaces, such as tables and couches. For those just setting up in business, a portable massage chair is ideal, as its lower footprint offers the flexibility to take on a smaller (and usually more affordable) working space – a sensible decision for the early years, while you’re building up a reputation, and the income that goes with it. Some individuals have also commented that they found a portable massage chair useful for carrying out the necessary aftercare following eye surgery, but, as with all medical uses of over-the-counter products, it is advisable to consult with your physician before purchasing any item for this kind of purpose.